Enlargements of the New Frontier Congressional Gold Medal being on display in the Capitol Rotunda. The smaller, actual-size medals were awarded to astronauts Neil Armstrong, Buzz Aldrin, Michael Collins and John Glenn on Nov. 16, 2011. The first American astronaut to orbit the Earth and the crew of the first moon landing were bestowed by Congress with its highest civilian honor, the Congressional Gold Medal, during a ceremony held in the Capitol Rotunda in Washington, D.C. on Wednesday (Nov. 16). Mercury astronaut John Glenn and Apollo 11 astronauts Neil Armstrong, Buzz Aldrin and Michael Collins accepted the medals from Speaker of the House John Boehner, Senate Majority Leader Harry Reid, House Democratic Leader Nancy Pelosi and Senate Republican Leader Mitch McConnell. "They will tell you that they are not heroes. Don't listen to them," said McConnell. "America is only as strong as the citizens we produce and here are four of the best." "Gentleman, heroes or not, your acts were heroic," said Boenher. "Today we add you to your many honors, with respect and gratitude, the Congressional Gold Medal." Armstrong, Aldrin, Collins, and Glenn are the first NASA astronauts to be awarded the Congressional Gold Medal. Congress bestows the medal as its "highest expression of national appreciation for distinguished achievements and contributions." "We stand on the shoulders of the extraordinary men we recognize today. Those of us who have had the privilege to fly in space followed the trail they forged," said Charles Bolden, NASA Administrator and a former astronaut. "On behalf of NASA and all the astronauts past and present, I congratulate and thank each of you — John, Neil, Buzz, and Mike, our Congressional Gold Medal recipients." According to the legislation authorizing the medals' award, Armstrong was honored for "the distinction of being the first man to land a craft on the moon and first to step on its surface." Aldrin was similarly recognized for becoming "the second person to walk upon [the moon's] surface." Collins, who stayed in lunar orbit in the command module "Columbia" while Armstrong and Aldrin landed aboard the "Eagle" lunar module, was credited with helping "his fellow Apollo 11 astronauts complete their mission." "The Apollo 11 crew is honored to receive the receive the Congressional Gold Medal and accept on behalf of our fellow Apollo teammates, all those who played a role in expanding the human presence outward from Earth and those who played a role in expanding human knowledge in the solar system and beyond," Armstrong said. "We thank the Congress very much." Glenn, who seven years earlier circled the Earth onboard "Friendship 7" on Feb. 20, 1962, was recognized by the lawmakers for helping to "pave the way for the first lunar landing." Glenn served in Congress as a Senator from the state of Ohio for 25 years before returning to orbit at age 77 aboard the space shuttle. "We must consider ourselves among the most fortunate of all generations for we have lived in a time when the dream became a reality, when we could finally travel above the atmosphere around the Earth, where we could establish laboratories in space and do research, and for the very first time in history, leave human footprints on someplace other than Earth as Neil and Mike and Buzz made their epic journey," said Glenn. "These dreams were brought to life by one of the most dedicated and capable teams ever put together: workers, technicians, engineers and scientists. Honored as we are today, we certainly share this recognition with that great team." The four gold medals were presented more than two years after Congress authorized the New Frontier Congressional Gold Medal Act in July 2009 to mark the 40th anniversary of the July 1969 moon landing. President Barack Obama signed the act into law on Aug. 7, 2009. The hiatus between the act's passage and Wednesday's ceremony provided time for the Citizens Coinage Advisory Committee and the Commission of Fine Arts to develop a design for the medals and for the United States Mint to strike them. The medal's design, which the astronauts were consulted on, was approved in November 2010. Spacesuited busts of Armstrong, Aldrin, Collins and Glenn adorn the front of the gold medal. The Earth as seen from space, and a recreation of a photo that showed Aldrin with the U.S. flag on the moon's surface complete the medal's obverse. The reverse design depicts Glenn's Mercury capsule over the Earth juxtaposed by the Apollo lunar lander flying over the moon. Congress appropriated $50,000 for the gold medals to be created. The Secretary of the Treasury was authorized to have minted bronze replicas of the gold medals to sell to the public to offset the cost of the medals being awarded to the astronauts. Both 1.5-inch (3.8 cm) and 3-inch (7.6 cm) replicas were produced. The bronze medallions will go on sale through the U.S. Mint beginning at noon EST (0500 GMT) on Nov. 16 for $7.95 and $44.95 respectively. Armstrong and Glenn were recipients of the Congressional Space Medal of Honor for their "exceptionally meritorious efforts and contributions to the welfare of the nation and mankind." All four have received the NASA Distinguished Service Medal. 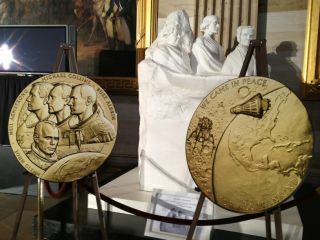 Visit collectSPACE.com for updates from the New Frontier Congressional Gold Medal ceremony and the release of the bronze replicas from the U.S. Mint.